I was so happy I got to spend a day in practice with my teacher Paul Wooden a couple of weeks ago. He is not very often in Australia these days so I grab any opportunity I can to practice with him. He has a beautiful way of reminding me about Grace and inviting me to feel into it more deeply. It only takes me a second to fall into his beautiful way of teaching, the way he speaks and what his says. This is one of the precious things about familiarity and having studied with his for a long time, I didn't need to watch what he was doing or work out what he was saying, I felt like I had simply picked up where we had left off last time. This kind of long term connection with a teacher allows us to move more and more deeply into practice each time we are with them. Next week, I am heading off for a weekend retreat with my mentor and teacher Leigh Blashki who is a senior iRest teacher (there'll be iRest). I am looking forward to spending time in sangha with Leigh and fellow teachers learning from such an inspiring man. 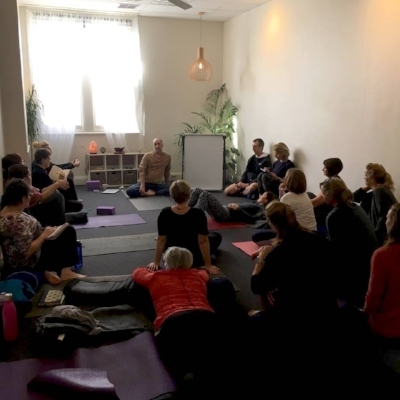 Leigh and Paul give me two different and important aspects of yoga and they have both been very important influences for me for over 10 years. I feel so fortunate to have these two incredible teachers in my life. I think we all need teachers on this path. And I don't mean a guru who you blindly follow because they say so, I mean someone who can show you the door and encourage you through it in your own way. Who invites you to explore the teachings through your own eyes. Ultimately, it is your path. Only you can walk it. You can't walk someone else's experience. A good teacher will allow the space you need to explore for yourself and be there for your questions or for those times when you have deviated from the path. I have the deepest love, gratitude and respect for all the teachers I have met on the yogic path, some have had a more profound effect on me than others, but as it is said in the Bhagavad Gita: 'No effort is ever wasted on the Yogic path'. I have had many amazing teachers on the path including Shirley Murray (my very first teacher, who I adored), Cheryl Floyd, Kaye Tribe, Janet Lowndes, Richard Miller, Fuyuko Toyota, AG Mohan and others. They all hold a special place in my heart and I am so grateful.